Ashikaga Yoshiakira (足利 義詮, July 4, 1330 – December 28, 1367) was the 2nd shōgun of the Ashikaga shogunate who reigned from 1358 to 1367 during the Muromachi period of Japan. Yoshiakira was the son of the founder and first shōgun of the Muromachi shogunate, Ashikaga Takauji. His mother was Akahashi Tōshi, also known as Hōjō Nariko. His childhood name was Senjuō (千寿王). He spent his childhood in Kamakura as a hostage of the Hōjō clan. His father Takauji joined forces with the banished Emperor Go-Daigo. The Kamakura shogunate was overthrown, and Go-Daigo began the process which came to be known as the Kenmu Restoration. Yoshiakira assisted Nitta Yoshisada (1301–1338) in his attack on the Kamakura shogunate. In 1349, an internal disturbance of the government caused Yoshiakira to be called back to Kyoto, where he found himself named as Takauji's heir. On 5 April 1352, Loyalist forces led by Kitabatake Akiyoshi, Kusunoki Masanori and Chigusa Akitsune occupied Kyoto for twenty days before Yoshiakira was able to retake the city. Loyalist forces led by Masanori and Yamana Tokiuji captured Kyoto again in July 1353, but were repulsed by Yoshiakira in August. In January 1355, Loyalist forces led by Momonoi, Tadafuyu, and Yamana captured Kyoto again. However, Kyoto was recaptured on 25 April by Takauji's and Yoshiakira's combined forces. Yoshiakira succeeded his father Takauji as Sei-i Taishōgun after his death in 1358. 1358 – Takauji dies; Yoshiakira appointed shōgun'7; dissention and defections in shogunate. 1365 – Emperor Go-Daigo's son, Prince Kaneyoshi (also known as Kanenaga) gains control of Kyushu. 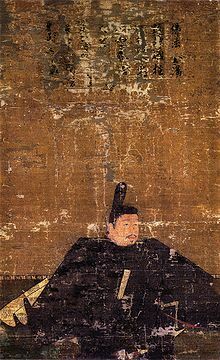 1367 – Kantō kubō Ashikaga Motouji dies; Yoshiakira falls ill and cedes his position to his son. Some months after his death he was succeeded by his son Ashikaga Yoshimitsu, who became the third shōgun in 1368. Yoshiakira was posthumously named 宝篋院 (Hōkyōin), and his grave is at Tōji-in, Kyoto, at the same site as his father's grave. The years in which Yoshiakira was shōgun are more specifically identified by more than one era name or nengō. ^ a b "足利 義詮" [Ashikaga Yoshiakira]. Nihon Jinmei Daijiten (日本人名大辞典) (in Japanese). Tokyo: Shogakukan. 2012. Archived from the original on 2007-08-25. Retrieved 2012-07-31. ^ "足利義詮" [Ashikaga Yoshiakira]. Dijitaru Daijisen (in Japanese). Tokyo: Shogakukan. 2012. OCLC 56431036. Archived from the original on 2007-08-25. Retrieved 2012-07-31. ^ a b Sansom, George (1961). A History of Japan, 1334–1615. Stanford University Press. pp. 81, 87–89, 92–97. ISBN 0804705259. ^ a b c d Ackroyd, Joyce. (1982) Lessons from History: The Tokushi Yoron, p. 329.